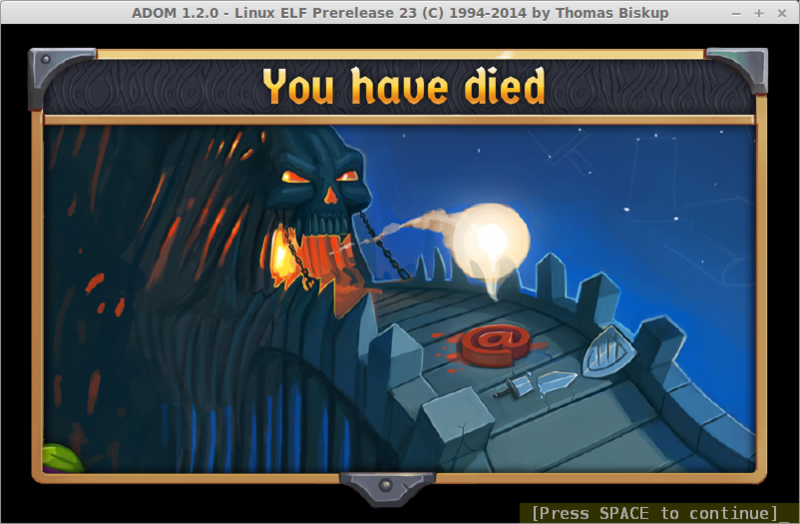 According to the developers ADOM is one of the most successful roguelikes ever made. It's quite a boast, so we check it out to see if it's any good. The game was originally released in 1994, so it's been around for a long time! It can be played in both an ASCII text mode and a graphical mode to please both audiences. ADOM was funded on Indiegogo where it gained over 90 thousand dollars in funding, wow! That was back in 2012 and they have a public build out for download right now. You can actually grab a free pre-release copy right here, but future versions won't be free by the looks of it. So, go grab it now for free as it's quite something. The game is a true roguelike in every sense of the name and it's difficult for someone like me to get into who has never played a "proper" one like this before. The game world is massive of course and full of random encounters to keep you interested. I simply love how it transforms from a top-down world view into a close-up view for when you are exploring different areas, that actually surprised me. The new graphical tiles look like they came out of the Indiegogo campaign and they are pretty nice to look at which for me helps, I've never seen the fascination with ASCII graphics I just find it awkward to look at. The interface is still quite confusing with most things requiring time to learn as it's all hidden behind keyboard shortcuts (not single key presses either! ), so I highly recommend running through the tutorial to get yourself up to speed before you play the main game or risk dying a lot. Prepare to read a lot too, there's a lot. There is just masses to this game and it doesn't spare any thought for your sanity either, considering for skills it has 14 different skills you need to keep an eye on. The great thing is it probably has endless hours of re-playability in it, it is permadeath though, so watch out for those bears. It's certainly interesting, but with a clunky interface it's a little hard to grasp. I'm a little torn on it as the tile-set is lovely when you go exploring dungeons and the exploration is interesting, but the interface and amount of learning involved ruins it a bit for me. Anyway, if you fancy seeing it on Steam then go give it a vote on greenlight. If you do give it a go, tell us what you think to it! It's a pity after saying "... we check it out to see if it's any good" you don't actually tell us if it's any good. Was it fun to play? Did the learning curve on the interface negatively impact your experience? Is having all that reading to do a good or bad thing? There's really very little to go on there. So...is it any good? Taking a look doesn't necessarily mean I've come to a conclusion on it all yet, it's just highlighting it. Edit > That said I've added a final bit. I played the hell out of ADOM back in the nineties, on my Amiga. Only ascii version was available back then, but it didn't matter a bit. For me it was better than nethack, angband and quite a few others. "ADOM Deluxe will include new challenge games, restorable save files and an extended character generation process allowing you to select from more options. 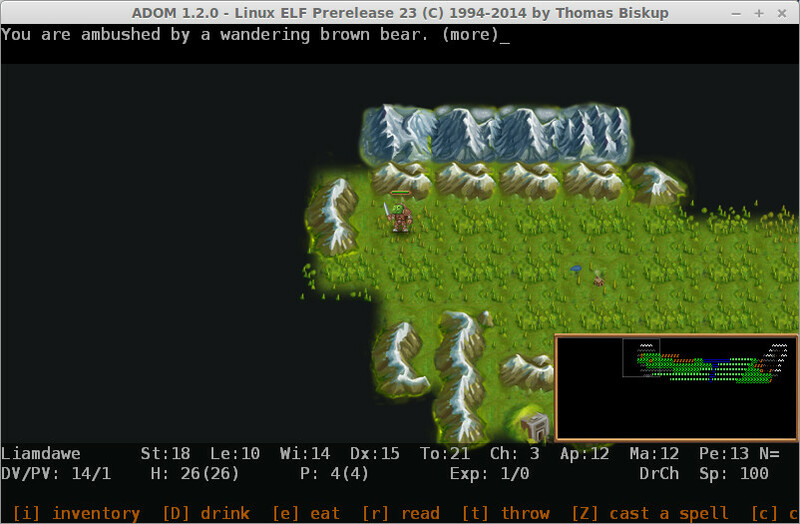 ADOM Classic still will remain free"
I got a bit confused by the language on their site. Quote The next pre-releases (Prerelease 24 and above) will only be available to people who pledged at least $25 in the ADOM resurrection campaign. So, it seems this version will forever remain free yes, but future ones are not. Ah ADOM, I've been playing it for years and I keep failing. It's a great addition to my Nethack addiction. This is the lastest publicly available prerelease. I think the graphics are a bit ugly. I wish it had Japanese / final fantasy 6 kind of graphics. I can see ascii appeal, ASCII is pure text, you don't see you just read. It's pretty fun and might keep me occupied until the new Dwarf Fortress release comes out. I don't like the graphics though, and the music is buggy, so I'm glad you can play in ASCII.